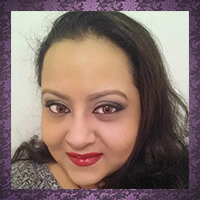 Hello guys, I’m Roselynn from Manicured and Marvelous. I’m really excited to be here, thank you so much Babi for having me. 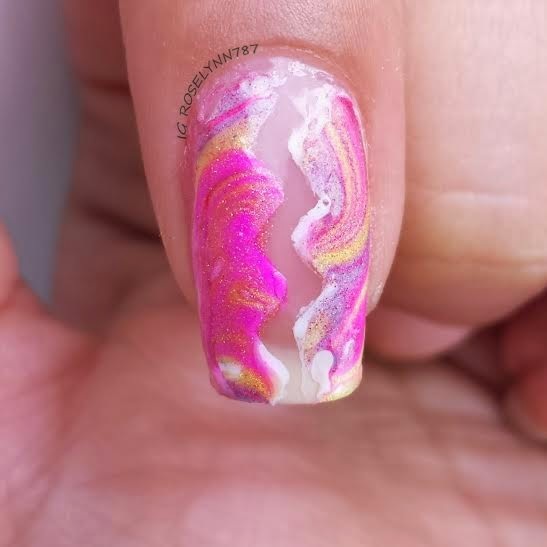 Today I have a really awesome, abstract, water marble using jelly polishes and combined with a cut-out design to show you guys. Normally I’d worry over having a neat pattern in the water but today we’re throwing that out the window. Put on your beret because it’s time to get artsy! 1. 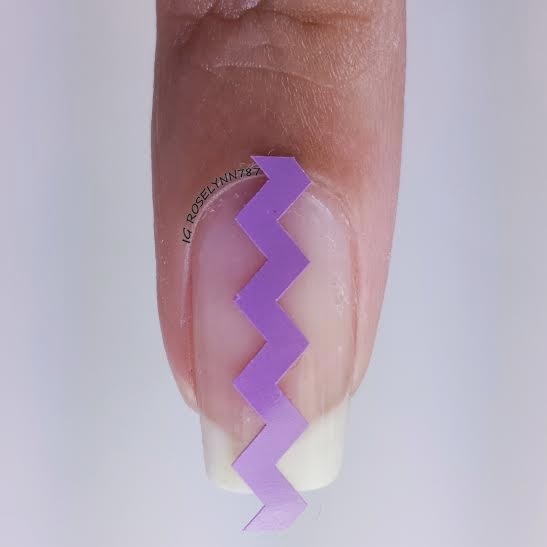 Nail Vinyls, or cut out some tape, in the style you’d like to use. 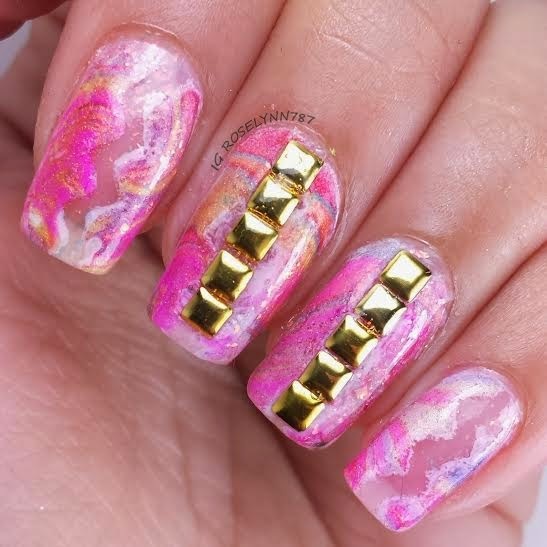 I’m going to be using chevron shaped nail vinyls for this tutorial. 2. Polishes, try to have at least 5 different colored ones. The ones I’m using are CDB Lacquer’s Foxy, Seductive, Attitude, Passionate, and Radiant. 4. A cup, I prefer glass, of room temperature water. 5. A couple of toothpicks. Start off with your favorite base coat to protect your natural nails. After your nails are dry, place a chevron vinyl, or tape, right down the middle of your nail. 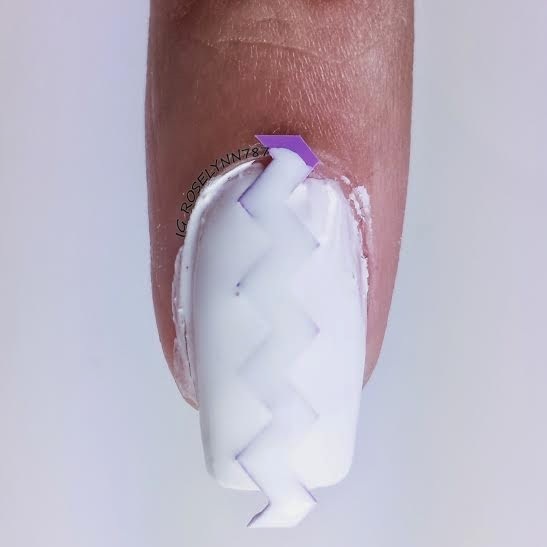 Make sure all the edges are firmly pressed against your nail, and then proceed to cover your nail and the tape with a white polish. Don’t worry about cleanup at this point, trust me. Now it’s time to play with your water, also known as, the really fun part. I let a single drop of each color fall into the water and spread. I did each color in a rotation twice but you can feel free to continue rotating if you’d like. You have to move quickly with this cause you don’t want your colors drying. In the photo below you can see steps 4 through 6. In step 5, after I rotate dropping the colors, I take a toothpick and move the colors around in the water. Kind of in a whirl/circle pattern and a little bit of zig-zag as well. Anything goes here guys. You can do lines back and forth or however you’d like. 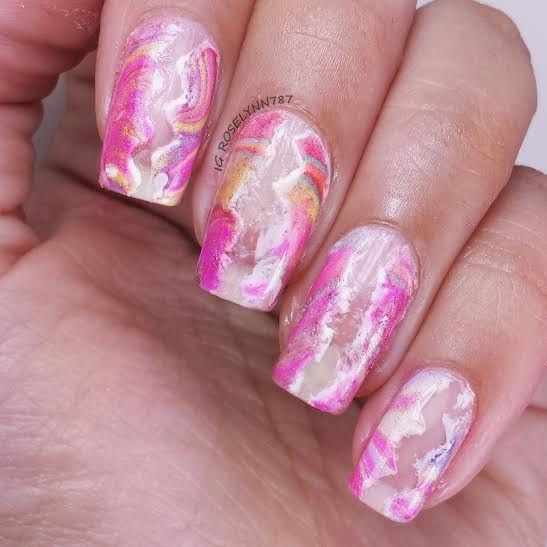 Remember, it’s supposed to be abstract and no two nails will look the same. 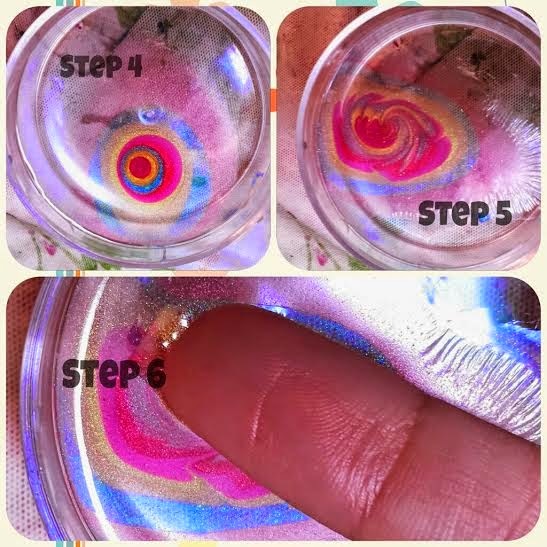 In step 6, I dip my finger in the water for a few seconds before twirling a toothpick around the edge to pick up the excess polish. This next step is where I start muttering curses to myself because I forgot to put either Vaseline or tape around my finger for easier cleanup. Cleanup isn’t as terrible if you move quickly and wipe away while the polish is still wet. Before you clean up around your nail, however, use tweezers and pull away the tape or nail vinyl. Don’t worry if it smears a little here and there. Or if you’re like me and need more ‘Pop!’ factor, add some studs or rhinestones. What do you think guys? It’s really a fun worry-free mani that’s perfect for the summer time if you use bright colors. 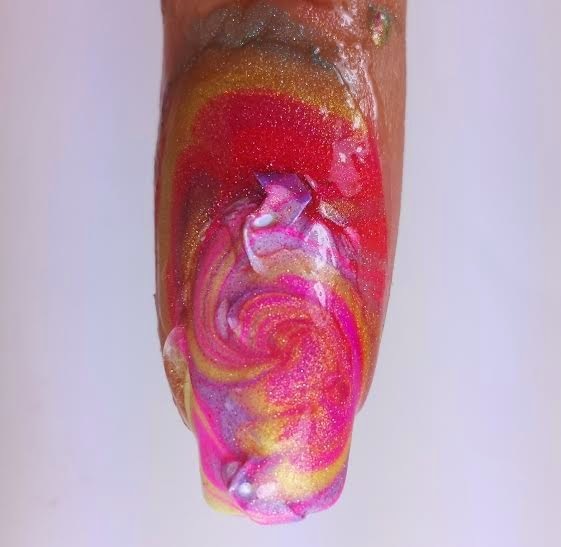 Doing your nails is always supposed to be fun so don’t worry about not being experienced with certain design elements. 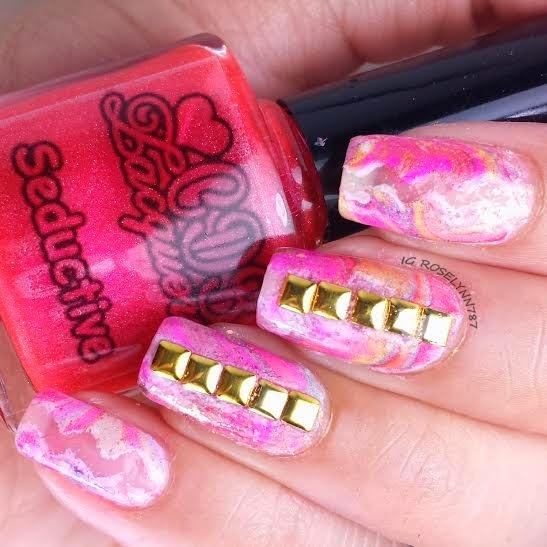 Throw some caution to the wind and try some funky things with your nails, you’d be surprised at what you come up with. Hope you’ve enjoyed the tutorial, I love to hear from you guys so don’t forget to drop me a line. Take care!